It feels the art of the big play set has been lost on the modern toy industry. As a kid, I loved stuff like the Power Rangers base, or Hasbro's Star Wars playsets, but they seem to be a dying thing in favour of smaller sets or vehicles. But good news! Age of Ultron is getting an awesome looking Avengers tower. Nifty! But what are those translucent things at the bottom? Turns out they're... Ultron? They look absolutely insane. 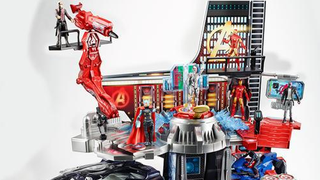 A lot of folks are speculating these 'Sub-Ultron' beings are spoilers for the movie, but they look way too much like crazy toy tie-ins produced for the merchandise rather than actual spoilers for Age of Ultron. Kinda want that to be wrong though - they look ridiculous in that sort of cool 'early 90's toy tie-in line' way. I mean, the lower half of that Ultron is just a HOLOGRAPHIC ROCKET LAUNCHING SIX WHEELER. Who wouldn't want that in the movie? Presumably these figures, and more, will be showing at Hasbro's booth for Toy Fair 2015 next month - according to Yahoo, they'll be out next month too. Man, the merchandise is ramping up early for this!